A big welcome to April at Ba Mack Farmstay. The heat of summer is now over and we are really looking forward to the promise of lots of beautiful rain this season. Summer and Autumn have been such an incredibly dry time with little rainfall – which means hand feeding our stock twice a day. Shearing was completed in February, which was early this year – so from now on our yearly shearing will be in February instead of June / July. Still lots of eggs to collect and enjoy each day – two dozen new hens have joined our egg laying team to give you lots of yummy eggs each day. The outside of our Train Carriage is still being painted to bring it back to it’s original former glory with it’s original colours. All going well, this should be completed in the next few months. It has been a slow process as all work is done in between farmstay guests. We are still operating our Train Carriage for our farmstay guests 4 nights a week and 5 nights a week during school holidays. All the preparation work and painting is done in between farmstay guests. 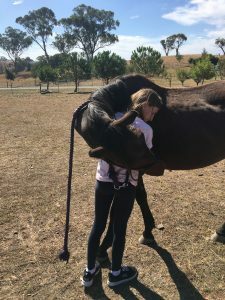 “Cody” is Farmer Kate’s beautiful horse – together they have formed the most amazing bond that can only be seen to be believed. We have had the pleasure of having “Cody” live with us for about 8 years. He, together with “Speedy” were our 2 main horses that we used for many years giving children lead horse rides around our farm and to help guests gain confidence with horses. When “Cody” first arrived on our farm he was very unsure whether to put his trust in our hands. Things changed when Farmer Kate spent many an hour in the paddock with him and gained his complete trust. Together they both enjoy sharing a love of “Liberty Work”. Today “Cody” has now retired from official led horse rides and has taken on the role of “Official Guest Hugger”. Every guest during their stay with us is offered a hug from “Cody” – he loves it and so do our guests.